The Annual Chrysanthemum flowers for a long time; from the summer through to the first frost of the year towards the end of autumn. Visit this page for information on Perennial Chrysanthemum. They have daisy like flowers of many different colors yellows, reds, whites and pinks; often the petals have two shades of differing colors. Leaves are lance shaped or feathery. The Annual Chrysanthemum varieties range in size from 10 to 90 cm. Some of the common names include Corn Marigold, Snow Daisy, Mini Marguerite, and creeping daisy. 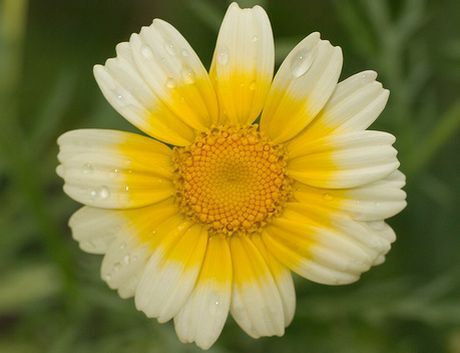 Latin names include chrysanthemum segetum and Chrysanthemum paludosum. The larger species of Annual Chrysanthemum are great border plants, whereas the smaller varieties can be grown as edging plants. They also make ideal cottage garden plants. Corn Marigold by Far Closer. 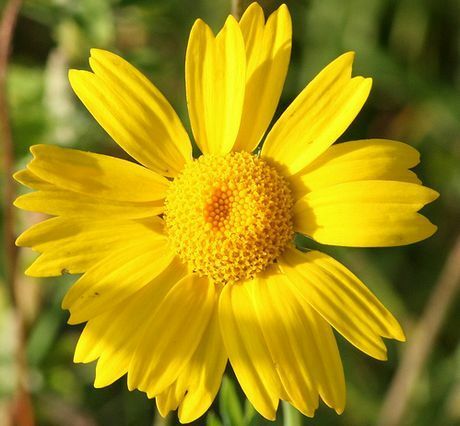 Chrysanthemum segetum, the corn marigold, is now defined as a member of the genus Glebionis and has the interchangeable scientific name Glebionis segetum. Chrysanthemum paludosum is a commonly grown annual chrysanthemum and has many varieties such as 'North Pole' pictured above. The Chrysanthemum genus contains around thirty species; these are mainly perennials. They belong to the family Asteraceae, a family that contains 477 genera. Some of the closely related family members include: Yarrow (Achillea), Aster (Aster) and, Daisy (Bellis). Common Names: Corn Marigold, Corn Daisy, Annual Chrysanthemum. Flowers: Summer to first frost. Flower Details: Yellow, red, white, pink. Daisy-like. Foliage: Herbaceous, deeply lobed leaves. Sow Outdoors: 1/8 inch (3mm). One or two weeks before last frost. Spacing 6 to 18 inches (15 to 45 cm). Sow Indoors: Germination time: ten days to two weeks. Temperature 60 to 70°F (15 to 21°C). Seven or eight weeks before expected last frost. Transplant outdoors following the last frost. Miscellaneous: Recently reclassified into the Glebionis genus from the Chrysanthemum genus. Leaves and shoots have culinary use. If planning to grow annual Chrysanthemums outside from seeds, then they should be sown at a depth of 3mm into a sunny area of the garden that has good drainage before the last frost of spring. If you plan to grow Chrysanthemum plants indoors first then the process should be started about 2 months before you plan to transplant the seedlings outdoors (generally after the last frost of spring). Corn Marigold / Annual Chrysanthemum takes about one and a half weeks to germinate at around 18 degrees Celcius. It is easy to carry out chrysanthemum care. Once growing pinching the annual Chrysanthemum seedlings will help to create bushy plants. Once flowers have finished they should be removed. It may be necessary to stake the taller varieties of annual Chrysanthemum. 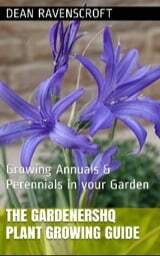 These very tender perennials are grown as annuals in the garden. 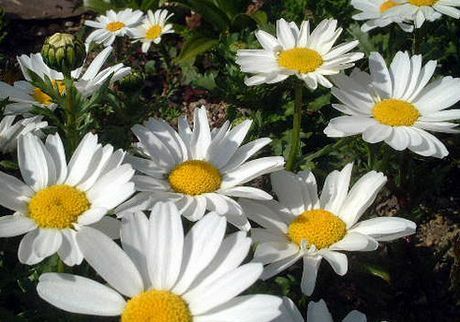 They reach an height of 12 to 18 inches (30 to 45cm) and have White petals with a yellow center. They are able to grow successfully in zones 9 to 11 in the USA. Sow them about 10 inches (25cm) apart in a sunny area of the garden after the last frost of spring; or start indoors and transplant later. Depending upon when started they will bloom from Late Spring (started Indoors) or Summer and continue through to the middle of autumn. They are able to tolerate many soil types. For best results pinch the plants to encourage bushiness, and deadhead to encourage further blooming. These annual plants reach an height of 12 to 24 inches (30 to 60cm) and carry yellow flowers that come into bloom from the middle of summer and remain through to the start of autumn. They are able to grow in partially shaded areas, but have a preference for sunny areas. Seeds can be sown either in the autumn or spring, and should be spaced about 12 to 15 inches (30 to 40 cm) apart. They have been recorded as growing successfully in the USA in zones 4 through to 11.